The fields of management and leadership are full of simple schemes and classifications for understanding how people and processes tick. These can be a useful tool to turn to when planning change or when there is problem that is difficult to put a finger on. They provide concepts and vocabulary to help us explain problems to one another and find solutions together. Kurt Gebhard Adolf Philipp Freiherr von Hammerstein-Equord, the Commander-in-Chief of the WW2 German Army, had a fascinating system for classifying his officers. This system is amusing for its frank, perhaps outdated, description of most workers as stupid and the image it conjures of that much mocked workplace character – the “little Hitler”. We all recognise that person who enthusiastically applies rules and regulation without proper judgement or understanding of the systemic harm they are doing. However, I think it is too reductionist, rigid (and rude) for the modern workplace. We can all be lazy or industrious depending on how motivated, engaged, stressed or rested we are at a certain time. And we could all be considered smart or dumb with respect to a certain role or task, depending on our level of training, skill or experience. Both ourselves and our staff can be different types of workers in different circumstances and with respect to different activities. Fortunately, we can work to change these parameters in both ourselves and our staff. Improve work ethic by supporting staff wellbeing and balance and improving engagement. Increase capability through training, information and appropriate experience. 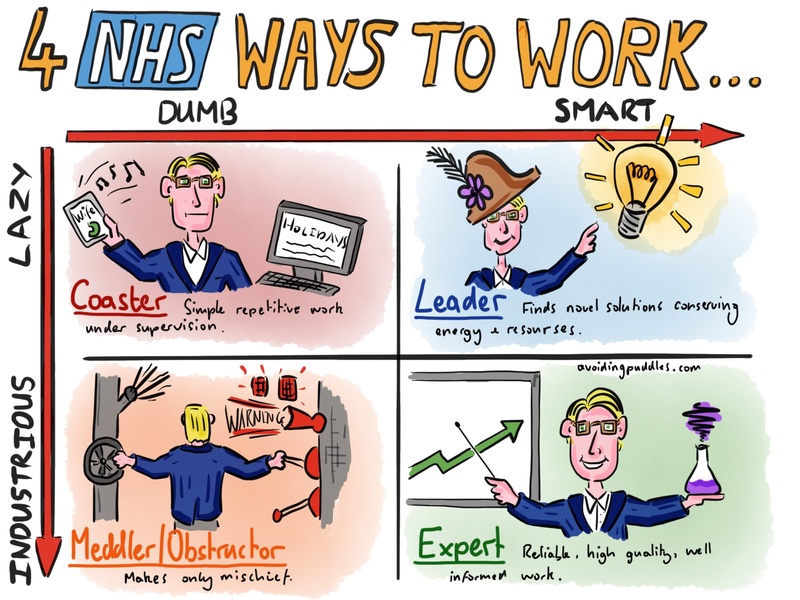 For the most part, in medicine, from reception to consultants, we want smart and industrious people. “Experts” in their role. But occasional we will need to put on our “lazy think” caps and look for novel solutions and new, more efficient and effective ways of working to solve difficult challenges. Of course, not everyone can be changed to the extent we might like. The key judgement will often come down to… Is this member of staff the right person for this role? And more importantly, am I the right person for this role? Be the industrious ill informed person and you will make only mischief for yourself and other people. The Expert – Smart and industrious, the expert is diligent, informed and keeps their training and skills up to date. They deliver reliable, high quality work and are valued by their co-workers, patients and employers. The Coaster – “Dumb” and “lazy”, the coaster lacks initiative and skill. But on closer inspection, perhaps it is that they need more training and confidence. As a coaster they are useful for simple repetitive tasks under close supervision. Beware, they will be vulnerable to replacement by robots and artificial intelligence. The Meddler/Obstructor – “Dumb” and industrious, this worker is often oblivious to their lack of skill, understanding or application of appropriate judgement. They are however enthusiastic, making frequent changes, or telling others to comply with their own, flawed, interpretation of rules. They cause mischief and more work for everyone. The Leader – These rarer individuals would happily be described as smart, but would likely prefer the term “efficient” to “lazy”. They would say they concentrate their effort where it counts. They are effective delegators, and know when a job can be good enough and where the extra effort is needed or will be recognised. Next Next post: The trouble with NHS Choices… And a better way to do feedback?